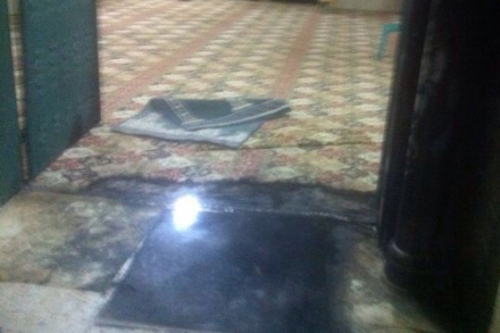 The Israeli forces broke into Al-Aqsa Mosque on Wednesday morning through Dung and Al-Silsileh Gates. Witnesses said that the Israeli forces (Special Forces, snipers, Intelligence, Musta’ribeen and borders police) broke into Al-Aqsa Mosque around 7:40 a.m. and were deployed in the courtyards of Al-Aqsa especially near Al-Qibli Mosque. They randomly fired sound grenades and rubber bullets towards the Marabouts in Al-Aqsa. Witnesses added that the Israeli forces assaulted the Marabouts in Al-Aqsa courtyards and surrounded the worshippers in Al-Qibli Mosque in addition to getting on top of the roofs and high area inside Al-Aqsa. The Musta’ribeen unit went on the roof of Al-Qibli Mosque in an unprecedented step. Sheikh Omar Kiswani, director of Al-Aqsa Mosque, said that the snipers fired live bullets during the break-in which hit the platform of Salah Eddin inside Al-Qibli Mosque. He also pointed out that the forces insisted on breaking-into Al-Qibli Mosque on Wednesday but the Islamic Awqaf intervened and prevented them. He added that the forces withdrew from the Mosque around 8:45 and the clashes last for more than an hour which is considered a serious escalation. Violent clashes broke out at Al-Aqsa gates after hundreds of Jerusalemites including employees of Al-Awqaf, constructions committee, students of Al-Aqsa Schools and other citizens were prevented from entering. The forces established iron barriers few meters from Al-Aqsa and dispersed the people present near the gates by force using batons and pepper gas. Witnesses said that dozens suffocated during the forces assaults and others were injured with bruises. The forces arrested one student from Lions Gate and assaulted and severely beat him; they also arrested one of Al-Aqsa guards, Mohammad Mujahed, near Al-Silsileh Gate. Around 10 a.m. the occupation police allowed the Muslims to enter Al-Aqsa on condition of detaining their IDs at the gates. They also searched the bags of every worshipper entering Al-Aqsa so that they don’t sneak in food for the Marabouts. During the violent clashes at Al-Aqsa, the forces allowed 40 settlers to break-into Al-Aqsa through Dung Gate towards Al-Silsileh Gate without allowing them to carry out their usual tour in Al-Aqsa courtyards. Dr. Ziad Sroor from Al-Aqsa Mosque clinics explained that 30 citizens were injured with rubber bullets where most of the injuries were moderate; note that the injuries were mainly in the head, face and chest. Sroor pointed out that the occupation forces used a new weapon on Wednesday which is a “clear rubber that has a needle and a poisonous substance inside”. When the bullet hits the body, the needle comes out and spreads the poisonous maters on the body causing stains. 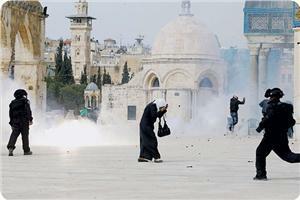 Dozens of Jerusalemites suffocated after they were sprayed with pepper gas. Israeli forces in the Bethlehem district on Sunday set up a military base on the roof of a Palestinian house, a Ma'an reporter said. In the village of Tuqu southeast of Bethlehem, Israeli soldiers climbed to the rooftop of a house belonging to Nayef Hussein Moussa. The soldiers stationed machine guns on the roof and installed cameras to monitor the movement of Palestinians on a road that connects Jerusalem to illegal Israeli settlements in Hebron. Tuqu's municipality condemned the Israeli move, calling on the Palestinian military liaison office to intervene. The Israeli occupation authorities (IOA) imposed hermetic closure on the West Bank for two days starting Sunday due to Jewish religious holidays. The decision, according to local sources, would deprive thousands of workers, merchants and patients from entering occupied Jerusalem and 1948 occupied lands. The IOA had closed all West Bank crossings last week for two days also due to Jewish religious holidays. Israeli Occupation Forces (IOF) waged several large-scale raid campaigns against Jenin refugee camp, along with Yabad, Sila al-Harthiya, and Yamon villages on Sunday. 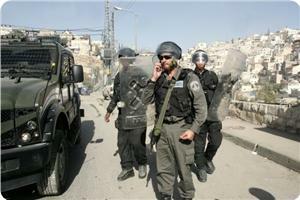 Several Palestinian homes were stormed and native civilians were arrested in the process. Local sources told PIC news reporter that two Palestinian youngsters, aged 19 and 20, from Jenin camp were kidnapped by Israeli soldiers disguised in civilian costumes. 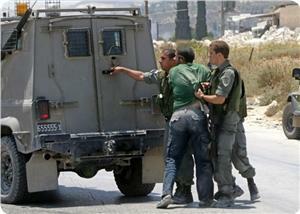 The boys were heavily beaten by IOF soldiers. 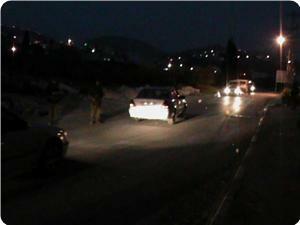 IOF invaded also Yabad town at dawn time and fired sound bombs to frighten the native citizens. 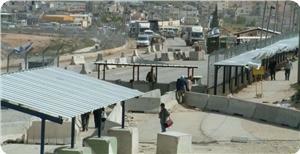 Several barriers were erected by IOF at the town’s main entrance. 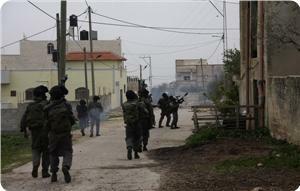 IOF raided Sila Harthiya west of Jenin and attacked its Palestinian inhabitants. 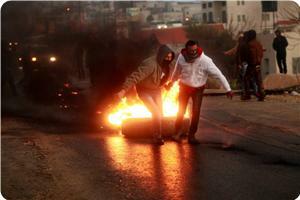 Several Palestinian houses were ransacked and native citizens were forced out for search. Yamon town was subject to a similar brutal invasion by IOF, who stationed around the Arkam mosque for long uninterrupted hours. In a related context, IOF raided Doheisha refguee camp, south of Bethlehem, where several homes were attacked and ransacked. PIC news reporter documented the raid and search of detainee Karim Jebril Hasanat’s home under pretext of pursuing the wanted captive, who has been detained in Israeli prisons for 10 years, despite his family members’ assertion that he is Israeli custody. In another event, IOF raided the homes of Palestinian citizens in Doheisha camp and handed ex-detainee Abd Qader Zaghlawi a summons for intelligence interrogation. Violent confrontations broke out between Palestinian youngsters and IOF soldiers in the alleys of the camp followed by heavy firing of sound bombs at Palestinian youths who responded by throwing stones. 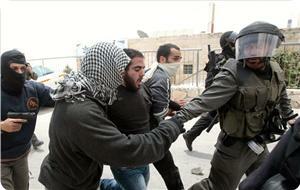 Such attacks and arrest campaigns coincide with the detention campaigns launched against Jerusalemites. The number of detained Jerusalemites has gone up to 294 Palestinians, including 36 sentenced to life, 37 minors under 18, and three female detainees. 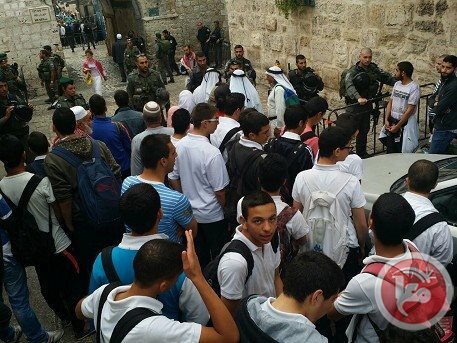 According to data published by Prisoners’ Families Committee and Palestinian Prisoner Society, the highest rate of prisoners is recorded in Silwan, south of holy al-Aqsa Mosque, with 80 prisoners, compared to 39 in Issawiya, 20 in Shafaat, and 24 in the Old City. Data revealed that detainee Samir Abu Naama, 54, has been held in Israeli lockups for 28 years and sentenced to life. A Jerusalemite minor 14, sentenced to nine months, is also reported to be held in Israeli prisons. The data further documented the imprisonment of Wael Kassim, 34, sentenced to life 35 times. For his part, Mourad Namir, 29, has been held in solitary confinement for nine months. The list includes 53 ill Jerusalemite detainees. Wadi Hilweh Information Center was informed that the Musta’ribeen (undercover unit) assaulted three children from the neighbourhood of Ras Al-Amoud on Friday. They are: 16-year old Naeem Zaghal, 17-year old Hamzeh Al-Ghoul and 16-year old Ahmad Al-Ghoul. Witnesses said that the Musta’ribeen assaulted the children and severely beat them during and after the arrest which led to several wounds and bruises all over their bodies. Israeli Occupation Forces (IOF) have brutally attacked and beaten a Palestinian child in al-Khalil southern occupied West Bank. According to Wafa News Agency, local sources confirmed that the 12-year-old child Amir Jaber was severely beaten before being detained by Israeli forces on Friday evening. The child was transferred to Beit Hadassah settlement built on Palestinian lands. He was then released after more than an hour. The Israeli occupation forces (IOF) on Friday afternoon intensively fired tear gas grenades and live bullets at dozens of Gazan citizens participating in a peaceful march in solidarity with the Aqsa Mosque to the east of the Gaza Strip. This happened after hundreds of young men marched following the Friday prayers to the east of the eastern cemetery and rallied near the perimeter of Nahal Oz military post behind the security fence in Shuja'eiya district. The protestors carried Palestinian flags and chanted slogans in solidarity with the Aqsa Mosque. A spokesman for the health ministry told the Palestinian information center (PIC) that no casualties had occurred among the protestors during the time of reporting the news, but ambulances were sent to the area. For its part, Yedioth Ahronoth newspaper said that Israeli soldiers arrested on Friday afternoon a Palestinian young man near the border fence to the north of Gaza. Walla news website, however, said that Israeli troops were dispatched to an area near Nativ Haasara settlement after receiving information about the infiltration of a Palestinian young man from Gaza. The young man, then, was taken into custody and interrogated by the Shin Bet in a detention center, according to Walla. 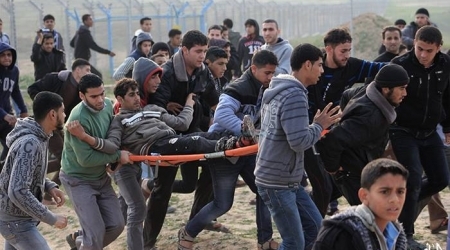 In a separate incident, a spokesman for the health ministry in Gaza said that a 24-year-old young man was badly injured in his left feet when Israeli soldiers stationed to the east of Jabaliya district opened fire at him. He added that another Gazan also suffered injuries when a homemade rocket accidently exploded near Musab Bin Omair Mosque in Al-Zaitoun neighborhood, east of Gaza city. Dozens of Palestinian activists were injured in Qaryut village, south of Nablus city, after Israeli occupation forces (IOF) heavily fired teargas canisters at them. Bashar Al-Qaryuti, an activist in the village, told the PIC reporter that IOF soldiers encircled the activists while performing the Friday prayers on their confiscated land, off Shilo settlement. He said that dozens were injured in the IOF teargas attack and physical assaults and were all treated on the field. 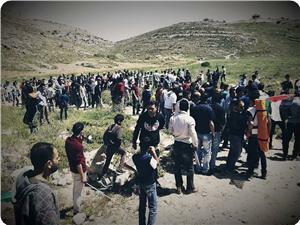 The Israeli occupation authorities had announced a week ago the confiscation of one thousand dunums of Qaryut land. Meanwhile, IOF soldiers raided Azun village, east of Qalqilia, at dawn Saturday and served summonses to a number of young men for intelligence interrogation. Eyewitnesses told the PIC reporter that three IOF patrols were deployed in the town’s center while others served the summonses in the eastern suburbs and the cemetery area. Dozens of Palestinian young men suffered injuries during violent clashes on Friday afternoon with the Israeli occupation forces (IOF) in Silwad town to the east of Ramallah city. An Israeli soldier suffered a bad injury when a stone hit one of his knees during the events, according to the Palestinian information center (PIC) reporter in Ramallah. The angry young men, who were protesting Israel's violations against the Aqsa Mosque, torched several tires and rolled them towards concrete barriers used by Israeli soldiers to protect themselves from stone attacks. Consequently, the burning tires caused a raging fire near the barriers, prompting the soldiers to take buckets and empty containers from nearby houses to extinguish the blaze. Confrontations also took place in Nabi Saleh village, northwest of Ramallah, between the IOF and Palestinian young men during the weekly anti-settlement march. 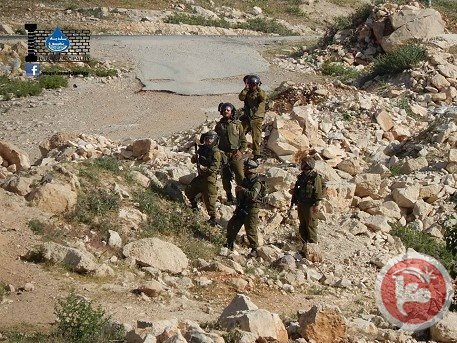 Eyewitnesses told the PIC that scores of Palestinian citizens and foreign activists tried to reach the village's water spring, which was annexed by the Israeli army to the nearby Israeli settlement Halamish. The soldiers near the spring showered the protestors with a hail of tear gas grenades and prevented them from advancing. In Birzeit town, Palestinian young men on Friday afternoon clashed with Israeli troops and torched tires near Attara checkpoint in protest at the ongoing Jewish violations against the Aqsa Mosque. 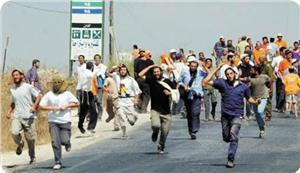 The soldiers at the checkpoint responded by firing tear gas grenades and rubber bullets at the young men. Some young men suffered from tear gas inhalation. At the same time, the IOF suppressed the weekly anti-wall march in Bil'in village and caused several tear gas injuries among Palestinian and foreign protestors. 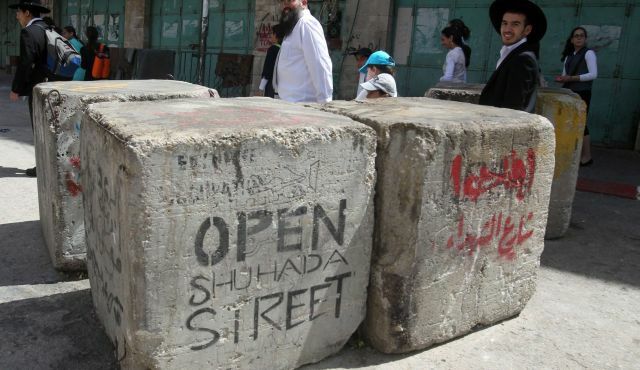 Settlers on Shuhada Street in Hebron, which is closed to Palestinians. The Jewish residents of Hebron will look back at the 13th of April 2014 and smile in nostalgia at the second time they managed to deceive an entire country. 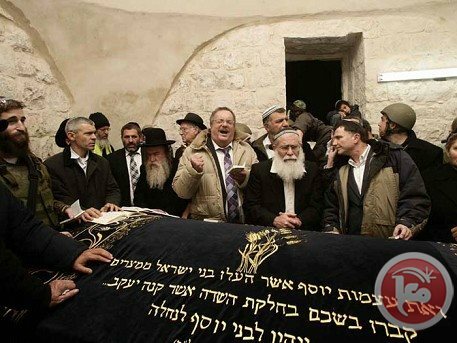 With the Israeli Defense Minister’s approval, a group of settlers entered and seized the Rajabi family’s home in Hebron last week. Three decades after the last Hebron settlement was erected, this event marks a new chapter in the story of Israeli settlement in the city of our forefathers and mothers. There is nothing new under the sun. With deliberate symbolism, settler leaders have returned to the original trick they used to establish the first Hebron settlement during the Passover of 1968. At the same time of year, several months after the start of Israel’s occupation of the West Bank in the wake of the Six-Day War, Rabbi Moshe Levinger asked the government to allow him to spend Passover in Hebron, together with a number of his supporters. The government agreed, so Levinger and his comrades invited the public to join the celebration. In a message to a religious Zionist newspaper, they added a small request: “bring refrigerators!” Since refrigeration was obviously not a necessity for the holiday itself, the message exposed the settlers’ preconceived plans to extend their stay. Indeed, at the end of the holiday, Levinger and his followers refused to vacate, leaving the government ministers scratching their heads. The state’s response in the spring of ’68 paved the way for the establishment of Israeli settlements in the heart of the Palestinian city of Hebron. After allowing the settlers to remain in the city, the government spent the next decade acquiescing to settler demands time after time. At the end of the day, the Hebron settlers received the official state recognition they sought, while their territory expanded throughout the 1980’s. The existence of an Israeli settlement in the heart of Hebron, the largest Palestinian city in the West Bank, exacts a high price on the local population. The lack of law enforcement against settler violence, the Israeli separation policy restricting Palestinian movement in the city center and the IDF activity in neighborhoods surrounding the settlement have all caused the heart of Hebron to virtually empty of its Palestinian residents. Hebron’s commercial center, which served as the social and cultural center for more than half-a-million nearby residents, stands deserted today. Stars of David and racist settler graffiti adorn the doors of Palestinian shops, closed due to military orders. The new Rajabi House tenants hung giant banners reading “House of Peace” on the building’s walls after their arrival, yet the new settlement bodes anything but peace. Alongside the clear political significance of establishing the first new settlement in the city since the 1980’s, Israeli presence in the Rajabi House poses a grim future for Palestinians living in the surrounding areas. Just like the consequences caused by previous settlements in the city, with the introduction of settler neighbors come restrictions on movement, IDF patrols inside homes and violent attacks on passersby. Populating the Rajabi House will in effect empty the Palestinian neighborhoods around it. This claim is not based on unfounded prophecies but simply upon the fact that history repeats itself. Even today, only 24 specific Palestinian vehicles have permission to drive on the road where the Rajabi House is located. It is reasonable to predict that these restrictions will be expanded, in order to comply with the principle of separation according to which the Israeli security forces operate in Hebron. As in Passover of 1968, likewise in Passover of 2014; the settlers have forced the hand of the Israeli government and stuck another wedge in the heart of Hebron. The image being projected from the territories should rile every person who values justice and human rights. This is because the story of the settlement in Hebron does not revolve solely around our historical Jewish connection to the city, but also around the terrible price we pay – and force others to pay – in order to maintain Israeli control of the heart of a Palestinian city. Just like in 1968, in 2014 a small band of settlers sets the agenda for us, IDF soldiers, and for the rest of the country. Meanwhile, this agenda exacts an unimaginable toll on Palestinians living in the city. The author served as a combat soldier in the Levi Battalion of the Israeli military. Today, he serves as the Director of Research at Breaking the Silence. The Israeli occupation forces (IOF) raided Yabud, Kfirat and Daher al-Abed villages south of Jenin and harassed their Palestinian residents. Eyewitnesses told the Palestinian information center (PIC) that several houses were suspiciously photographed by IOF soldiers in Abou Shamla, Raas, and Malloul quarters. The invading troops created a military checkpoint at Kfirat’s main entrance, where several vehicles have been searched. 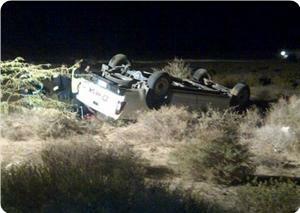 The incident coincided with extensive combing operations carried out by soldiers in Daher al-Abed. In a related context, Palestinian activists reported that IOF troops confiscated the tents provided by the Red Crescent for the farmers of Khirbet Jaouana east of Nablus, which was demolished last week by the Israeli army. Beit Fourik’s mayor Aref Hanani, who accompanied Red Crescent crews during the distribution of tents and blankets, confirmed that the IOF raided the area once again and confiscated everything that had been provided as relief aid for the villagers. A Palestinian citizen was seriously injured after being brutally assaulted by Israeli occupation forces (IOF) on Wednesday near Tarqoumia West of al-Khalil. 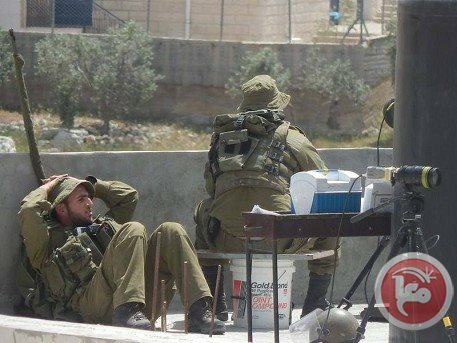 IOF soldiers have attacked and severely beaten the citizen Ahmed Abu-Assad, 37, on Tarqoumia crossing while in his way to his workplace, according to Safa news agency. Abu Assad suffered different injuries and bruises and was transferred to hospital in l-Khalil for treatment. The occupation forces have continued to tighten their security restrictions and attacks on Palestinians in villages in western al-Khalil city in failed attempts to arrest the man responsible for Tarqoumia operation in which a Jewish settler was killed and four others injured.